So, we’ve had a couple of new gems on the scene at our Happy Dog shows this fall, and one of them is the fantastic Cleveland Bassoon Quartet! Not only are they PHENOMENAL musicians, they always leave us and our audiences enraptured and even full of laughter! Get to know them here and find a way to catch them live! We’re the Cleveland Bassoon Quartet! We do have two fun nicknames based on the Italian word for Bassoon, Fagotto; The Fagtastic 4 and The Unfagottable Bassoon Quartet. For obvious reasons we have to explain these names, but for those who understand bassoon humor, they usually get a kick out of this! The four of us indulge in this project purely for the fun of it. We’re all busy gigging orchestral musicians so the opportunity to perform with this instrumentation is a huge treat. I think our audiences can see and hear this when they experience our performances. They are high energy, goofy and enjoyable for all. Where can people hear your next performance? We’ll be at The Root Cafe in Lakewood, OH – Wednesday, Dec. 21st 7-9pm. FREE! Sounds like you guys have a lot of fun! Do you have any focus on education or outreach as an ensemble? The bassoon is a very visual instrument. It’s huge, to start with and it’s made of beautiful mountain maple wood. Kids (and kids at heart!) are really drawn to the peculiarities of the bassoon when they see it live. We’re a newly formed ensemble, but we’d love to get out to some schools to educate and excite younger audiences about classical music. Do you have any long-term plans for the Cleveland Bassoon Quartet? We definitely want to make our holiday-themed concert an annual thing. 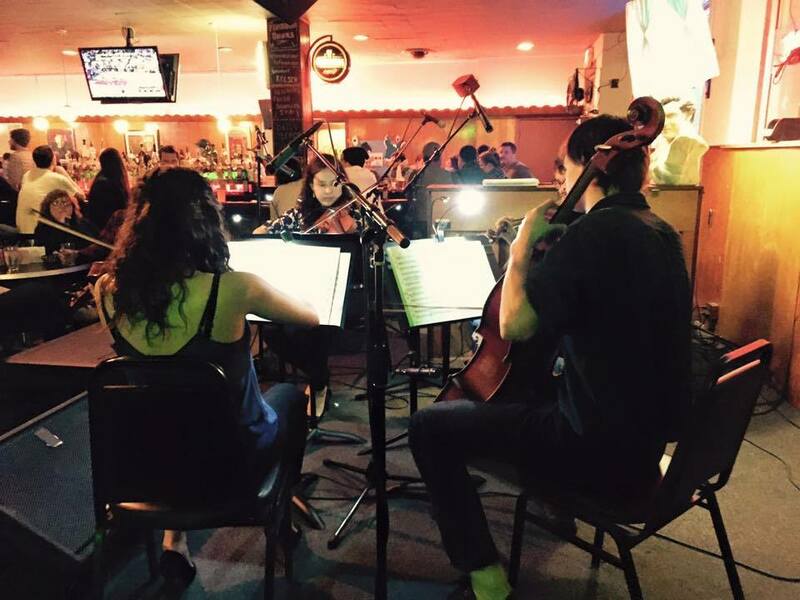 On Dec. 8th we performed some holiday tunes at the Holiday-themed Classical Revolution CLE at The Happy Dog and it was a blast! Recently one of bassoonists, JW Kriewall, found an amazing arrangement of Berlioz’s Symphonie Fantastique for bassoon quartet. The orchestral version features the bassoon section many times, but it’s a riot having all the parts written into a quartet. We’d love to have a concert featuring this piece! Arleigh: This summer I performed an outreach gig at a retirement center in Chagrin Falls. One of the residents at this home was a woman who in old age had gone completely blind. She was very moved by me and my colleague’s performance. After the concert, her friend asked if I would come over to talk with her blind friend. This woman was so personal and sweet. She held my hand, because it helped her feel more connected as she talked, and shared many musical memories from her past. The interaction ended with a big hug. Music is powerful stuff! Our bassoonist Ryan is a brewer of beer, JW is a Pokemon enthusiast, Carly is a enthusiastic dog mommy of Betty the rescue dog and Arleigh loves all things active & outdoorsy–skiing, biking, hiking, etc! Arleigh: Andrew Bird, Regina Spektor and Ray Lamontagne are some of the most original artistic voices I know out there. I think the musicians that have put down roots in Cleveland and don’t see it just as a transitional place in their life have formed an amazing and supportive network of original musical projects. Plus, Cleveland has some of the highest funding per capita towards the arts in the U.S.! Previous Musician Feature: The Mossburg Duo!